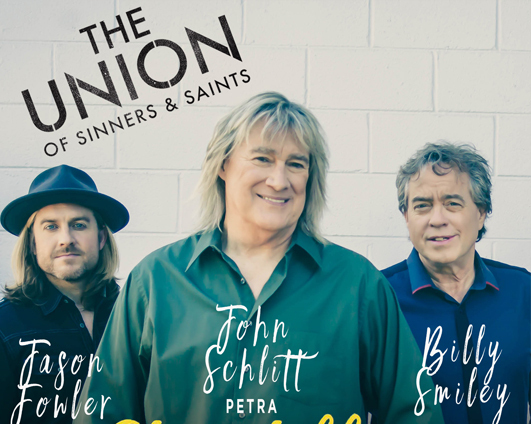 John Schlitt of Petra and Billy Smiley of WhiteHeart, the Top Selling 2 Christian Rock groups of all time, have something new going on. It is that constant motion and creative diversity that has fueled their latest project, The Union of Sinners and Saints, a smashup of Petra and WhiteHeart on the road together. The 1st release to radio in June was the #1 Song Independence Day, and their new singles “Old Guys Rule”(Rock), and “Rise Up”(Pop/AC), are playing across the nation in 2018. They also have a new 2018 Vinyl Album out featuring 4 of the favorite WH and Petra songs of all time. These guys are set to perform #1 Songs like Beyond Belief, Desert Rose, The Coloring Song, The River Will Flow, Just Reach Out, I Am On The Rock, and His Heart Was Always In It, plus many more. “With an intimate look at the journeys we have taken, we have so much to be thankful for and yet we are still excited to share the history, the music, and love for others, and hope to encourage the ones coming after us in their musical walks”, offers Smiley. Truly an event for the whole family, parents can bring their kids to discover the music of their youth, and connect in new ways.